I have to admit, I thought the photo which looks like a couple pic was about something else entirely, but it's actually Zhao Liying and her manager Huang Bin. Today, Zhao Liying shared that she and her manager have decided to part ways. The two have worked together for two years. It's no question that Zhao Liying's career has reached new heights in recent years and while it's a testament to the actress's hard work, it's also a nod to a strong support team. 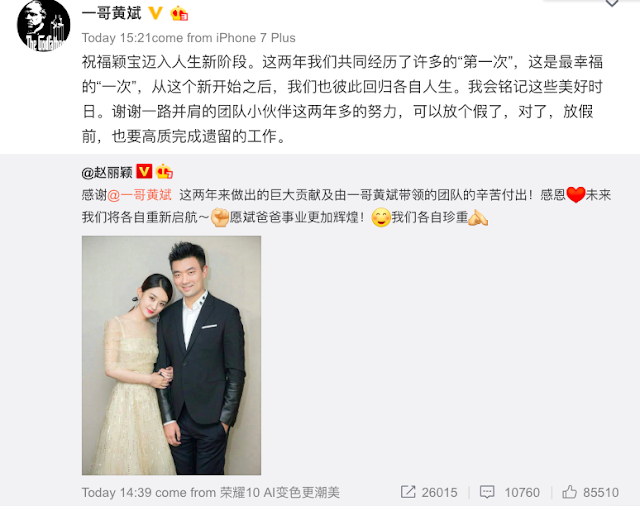 Zhao Liying writes a short message to Huang Bin to wish him well and thank him for leading the team in the last two years. 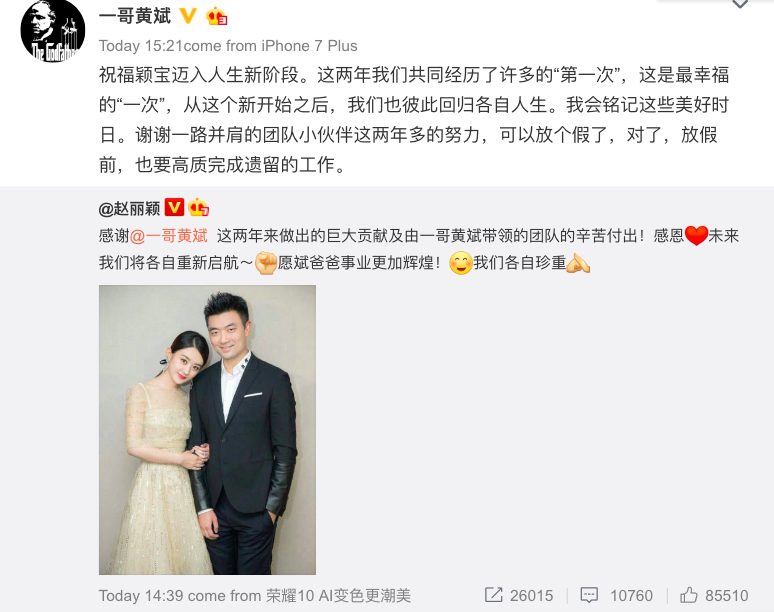 Huang Bin responds in kind and wishes her the best in the next chapter of her life. He says that they shared many firsts together and he will treasure the memories. He also thanked the staff and said that he can finally go on vacation. Interesting...seems like there are all types of changes going on with her at the moment. She needs to take time off for a longer period and he still needs to gain money. A manager who's pupil doesn't work probably loose contact network and influence. So it does make sense. Rumor has it she’s dissatisfied with the type of offers she got. Maybe he’s not the right resource. He was the one who got her into Boss and Me, Journey of Flower, Princess Agents, etc. correct? Before ZLY get any of those shows, she was not getting anywhere. His resources were great because he's known to be extremely competitive. No, he did not yet her any of those shows. She got Boss and Me before really getting popular and she was just rising when she got JoF. I believe she got PA early 2016 and she signed with Huang Bin a few months later. Out of the stuff he got, only her movies have aired.He also got her more fashion resources but that has never been her image. Huh weird, rumors got it he gave her Rouge and Old Nine gate that were both in 2016 so I thought she at least got PA from him. Maybe he isn't a good match for her after all since she didn't match to do movies, JTTW didn't have good box office hit. DIOR was definitely a very good opportunity, both her and ABB are tiny the same so I don't see why ZLY would not do well in fashion. I think the problem was just that english part she didn't practice for. And some of the clothes she gets to wear were not pretty enough, at the same time something would always go missing all the time such as having the wrong hair and make up, wrong shoe, and wrong undergarment that shows. I think Huang Bin was really giving her new opportunities to grow out because otherwise, she'll just be stuck in the same cute idol drama shows only. She just doesnt fit the image of high fashion. On top a lot of people always criticize her for her background and then she trying to do fashion with her background was really a mismatch. Personally, I don't see the big deal but there was a lot of negative press due to her having a country background and just a technical degree. Huang Bin honestly was not getting her the right projects. Even the movie with Han Han, she got bc Han Han wanted her and it had nothing to do with Huang Bin. Which is her most successful project under Huang Bin. She actually has a variety of dramas roles and I don't think she plays cute characters often. Shan Shan was the last cute character she played and if we push it JoF during the first half. If we say she has a preference for characters it would be really independent and a bit more arrogant characters. At least if we look at her recent roles with Rookie and PA. And her upcoming dramas will also play two very independent characters. I am kind of happy about it. I don't think he got her image right. Like he was getting her some projects that just didn't fit her. Plus, Huang Bin is nice but he really likes the spotlight. To the point that he is one of the few celeb managers that I know by name. All these other popular celebs but I have no clue who their manager is or what they are doing. She wishes to be married by age 30. On her birthday Feng Shao Feng is rumored to presenting her a diamond ring!